My friend had an abundance of black raspberries in her yard and gave me some fresh picked ones. They were heavenly plain, but there were a lot of berries, so I decided to make something with them. 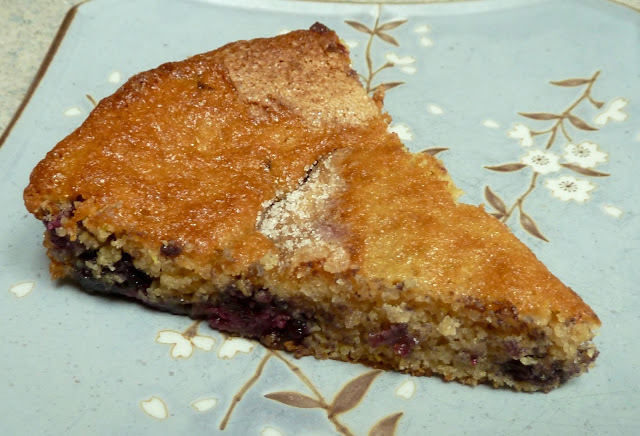 A photo of a berry buttermilk cake from Smitten Kitchen’s blog caught my attention. I converted that recipe into a gluten free version. I was surprised at how delicious the cake was. (I think that with no one watching anyone would eat the whole thing and I really don’t think it is just me, but you tell me.) This recipe is a keeper that I will be making again and again. I made the first one with butter and real milk and the second one with oil and almond milk. I made buttermilk by adding 1/2 Tbs. of vinegar to the 1/2 cup of milk and to the almond milk. For the dairy free version I used oil and added a 1/2 tsp. of butter flavored vanilla. I prefer to use oil in cakes to replace butter, it adds a nice moistness and does not affect the texture or taste. Both versions of the cake were scrumptious and drew much praise. The original recipe called for lemon zest. For some odd reason there have been no organic lemons available for a few weeks. Last year there was an organic lime shortage. (Something about drug cartels interfering with the shipping or production.) I prefer buying organic fruit when using the zest to avoid a dose of pesticides with my baked goods. The lime zest gave the cake a subtle and unique flavor that enhanced the whole cake eating experience. Sugar - for sprinkling on top of cake before baking. Fresh or Frozen Berries - blueberries, raspberries, blackberries and black raspberries would work best, but you can use strawberries cut up into smaller pieces also. Preheat oven to 400℉. 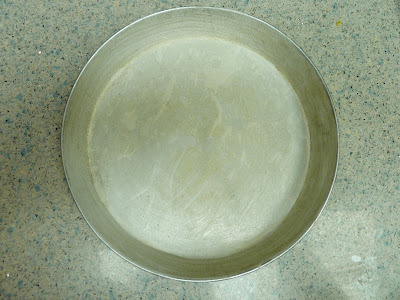 Prepare a 9” round baking pan by greasing and flouring it. I lined the bottom of the pan with a piece of parchment paper, which I greased and floured, to make it easier to take out of the pan. Parchment lined pan that is greased and floured. Make “buttermilk” by measuring out 1/2 cup of milk or non dairy milk into a bowl or large glass measuring cup and adding the 1/2 Tbs. of vinegar. Stir and allow it to rest for 10-15minutes. 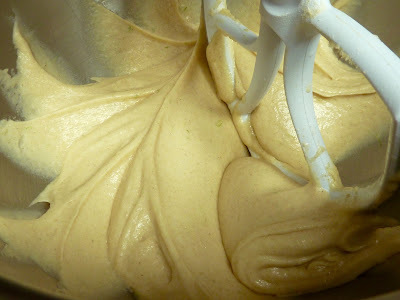 In a separate bowl add the flours, salt, xanthan gum, baking powder and baking powder. Mix well. Set aside. In a large bowl add the 2/3 cup of sugar and the butter, beat until light and fluffy. If using oil, just stir the sugar and oil together. Add the egg, lime zest and vanilla and mix well. Add 1/3 of the flour mixture and then 1/2 of the milk mixture and blend in. Repeat. Then add the last 1/3 of the flour mixture and combine well. Can you see the small strands of lime zest? Put the batter into the prepared pan. Arrange the berries evenly over the top of the batter. Sprinkle with the 1 1/2 Tbs. of sugar. My berries sank to the bottom and I enjoyed the texture with all the berries on the bottom. 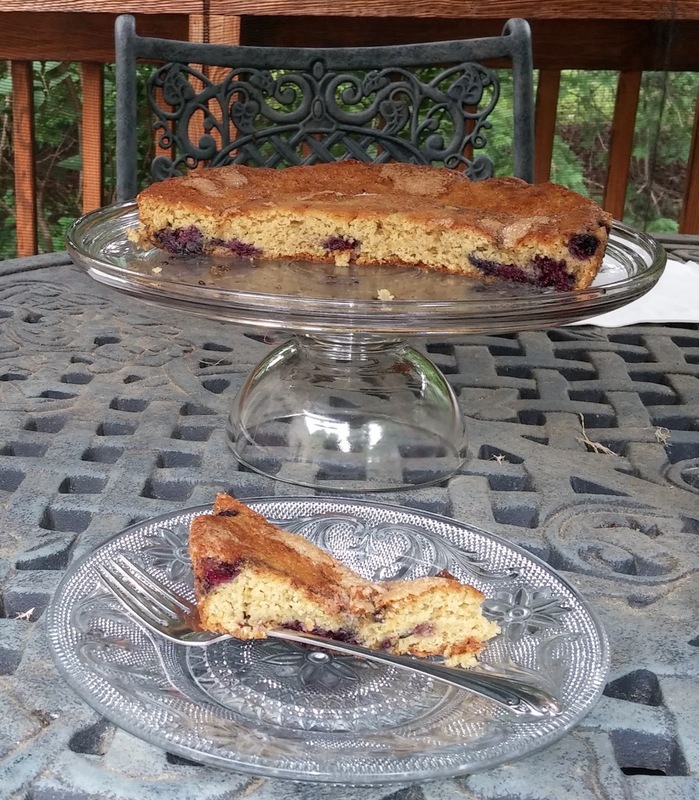 To keep the berries suspended in the cake coat them with some flour before putting them on the cake. Spreading the batter in the pan. Raw batter with berries and sugar over the top. Bake for 20-25 minutes until the center springs back when lightly pressed or when a cake tester or wooden toothpick comes out clean after being inserted into the center of the cake. Cake still in the pan, all baked. Cool in the pan 10 minutes then invert onto a wire rack to cool. I took a second wire rack and turned the cake right side up to prevent the rack from forming impression lines on the top of the cake. Serve warmed or at room temperature. This cake is wonderful plain, but a dollop of whipped cream or whipped coconut cream would not be too decadent. Having some cake on the deck. Everything tastes better outside on a sunny day. 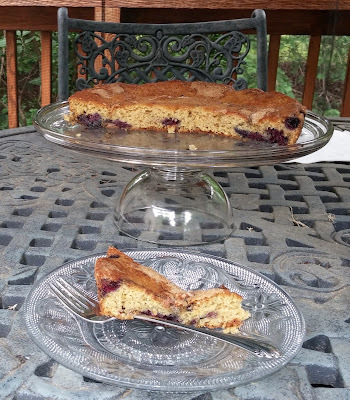 GLUTEN FREE RASPBERRY BUTTERMILK CAKE Makes one 9” round cake Ingredients 1/2 cup Sorghum Flour 1/4 cup Chickpea Flour 1/4 cup Tapioca Flour 1/2 tsp. 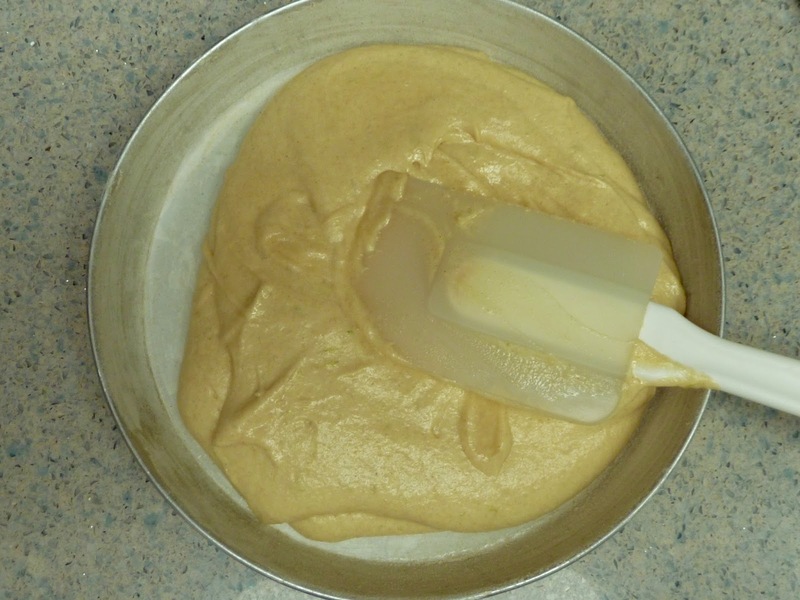 Xanthan Gum 1/4 tsp. Himalayan Sea Salt 1 tsp. Baking Powder 1 tsp. Baking Soda 4 Tbs. Butter or Canola Oil (or other mild flavored vegetable oil) 2/3 cup Sugar (I used evaporated cane juice crystals) 1/2 tsp. Vanilla extract (for dairy free add 1/2 tsp. of butter vanilla or an extra 1/2 tsp. vanilla) 1/2 tsp. Lime Zest - finely grated 1 large Egg 1/2 cup Milk or for dairy free Non Dairy Milk 1/2 Tbs. Apple Cider Vinegar 1 1/2 Tbs. Sugar - for sprinkling on top of cake before baking. 1 cup Fresh or Frozen Berries - blueberries, raspberries, blackberries and black raspberries would work best, but you can use strawberries cut up into smaller pieces also. Directions Preheat oven to 400℉. 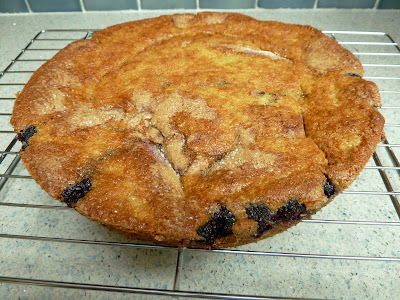 Prepare a 9” round baking pan by greasing and flouring it. I lined the bottom of the pan with a piece of parchment paper, which I greased and floured, to make it easier to take out of the pan. Make “buttermilk” by measuring out 1/2 cup of milk or non dairy milk into a bowl or large glass measuring cup and adding the 1/2 Tbs. of vinegar. Stir and allow it to rest for 10-15minutes. In a separate bowl add the flours, salt, xanthan gum, baking powder and baking powder. Mix well. Set aside. In a large bowl add the 2/3 cup of sugar and the butter, beat until light and fluffy. If using oil, just stir the sugar and oil together. Add the egg, lime zest and vanilla and mix well. Add 1/3 of the flour mixture and then 1/2 of the milk mixture and blend in. Repeat. Then add the last 1/3 of the flour mixture and combine well. Put the batter into the prepared pan. 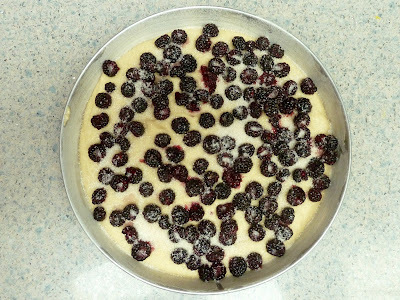 Arrange the berries evenly over the top of the batter. Sprinkle with the 1 1/2 Tbs. of sugar. My berries sank to the bottom and I enjoyed the texture with all the berries on the bottom. 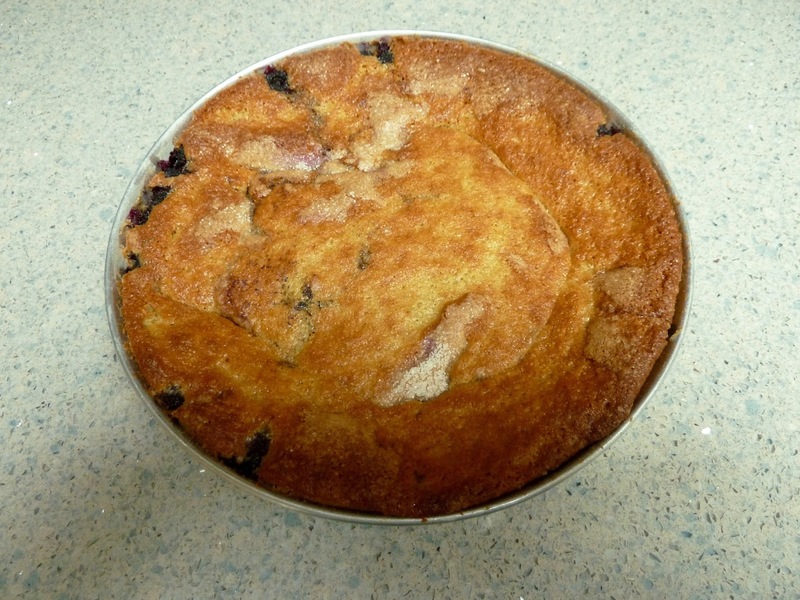 To keep the berries suspended in the cake coat them with some flour before putting them on the cake. Bake for 20-25 minutes until the center springs back when lightly pressed or when a cake tester or wooden toothpick comes out clean after being inserted into the center of the cake. Cool in the pan 10 minutes then invert onto a wire rack to cool. I took a second wire rack and turned the cake right side up to prevent the rack from forming impression lines on the top of the cake. Serve warmed or at room temperature. This cake is wonderful plain, but a dollop of whipped cream or whipped coconut cream would not be too decadent.